Drummer Rick Garvin has been playing since the age of two and has never looked back. As a young student, the drum corps was his passion…He just loved being a part of it. Beginning In the 1970’s and 80’s, Rick played non-stop in Funk, Rock, and Top 40 bands. When not traveling on the road, he would work part-time as a substitute teacher. One fateful day Rick was offered a full-time music teaching position…This soon became his true calling in life. He had become ‘Mr. Richard Garvin – music educator and positive role model’…teaching and shaping the lives of numerous disadvantaged youth in urban school district, Springfield, Massachusetts. Everyone who ever taught with Rick always enjoyed his company. Every morning he was discussing sports and statistics while simultaneously completing the daily crossword puzzle. I have never seen anyone multi-task so effectively… Nothing ever slipped by Mr. Garvin without him noticing. Being around Rick lifted the spirits of many fellow teachers – especially for those who were having a bad day. Over the many years we worked together, I never heard Rick utter a disparaging remark about a student or colleague. He would always emphasize, “If you can’t say something positive about someone, don’t say anything at all”. Now retired at sixty-four, Rick still practices every day – (When not babysitting his grandson Warren)…He never stops gigging. A truly gifted musician…Rick can play in virtually every style and sight read anything. Numerous times he is called at the last minute to fill in. One such gig was with The Melha Shrine Circus. The conductor handed him a huge pile of charts right before the show began. The scores were old and beat up with many numerous markings and crossed out sections. What could be interpreted as ‘Chicken Scratch’ to an average drummer, presented few challenges for Rick. His responsibilities included carefully watching each performer, adding cymbal crashes, fills, and accents, etc. for each different routine. He is presently playing with a few different groups including The Premier Swing Band, and The Phil Estabrook Big Band. I first met Rick Garvin in the 1990’s on a Shriner’s Circus gig. Art Serafino was the local contractor for the show. We played a rehearsal and 7 shows a week for three or four years. Art knew Rick since he was a child as he and Rick’s dad were friends. Rick did a fabulous job on drums reading all the charts and following all the cues - which requires intense focus and concentration in order to catch the cymbal crashes and numerous sound effects at the right moment. Fast forward to 2008 when Premier Swing was formed. Rick was the drummer and I was the woodwind player in this 8 piece group. Again, Rick did a great job sight reading all the charts, playing great solos and contributing ideas for the betterment of the band. Notably, he is also a remarkable, even-tempered guy who was always pleasant with a great sense of humor and full of ideas. Always wore a smile too! Then a couple of years ago I joined the Phil Estabrook Big Band. Rick was the drummer and again displayed great chops and excelled at sight reading. Always fun to play music with him! I've had the pleasure to play with Rick in many different band incarnations. He is the ultimate professional combining great time and accuracy… Two of the most important things for me when it comes to drumming.- Besides the pleasure of working with him, we also enjoy talking professional football and Rick’s favorite team – ‘The New York Giants’. He is always upbeat and positive…A great example for us all. "Rick played with our band The Capris for about 6 years steady and then off and on for the next 30 years, and still, until recently, is a regular with the Phil Estabrook Big Band. Just last month, he sat in and was fantastic! In addition, Rick was a regular with our marching bands. He marched with us in parades, and was a regular with us for the Eastern States Exposition Mardi Gras Dixieland Band. If I had only one thing to say, besides his extreme loyalty and dependability is that Rick is an inspirational drummer and person. Besides his incredible technique, his rhythms inspired us to play better. He never let us down or disappointed. In musical terms, he was always ‘Right There’. Rick is a supreme gentleman and I am super- proud to have worked with him, and to be his friend”. Considered a prodigy as a youngster, Rick embraced his drumming talents while also learning a multitude of other instruments. He is an accomplished keyboardist and trumpet player, and has mastered many others. As an educator, he taught all instruments to his band, and jazz band members - In conjunction with also teaching general music, marching band, and music sequencing in the Springfield, (Mass.) public schools for 35 years. Rick also taught at Falcetti Music Studios for over ten years. While at Falcetti’s, he taught drums and directed the percussion ensemble. On an interesting note, one of his former students was Jon Wysocki of Staind. In 1972, Rick was accepted to the Berklee College of Music in the performance program. Changed his major junior year to Music Education. It was the first year they offered the program. Rick’s class was the first to ever graduate with a Music Education degree in 1976.. While at Berklee, Rick studied with Alan Dawson, Gary Chaffee, and mallets with Gary Burton. He also played in Phil Wilson’s Tuesday Night Dues Jazz band where lots of famous musicians used to stop by on a regular basis. One memorable night, he got to back up Tony Bennett. Also at Berklee, Rick knew Neil Peart, Steve Smith, Casey Scheuerell and many other well - known musicians. Rick’s reputation as both musician and educator are first rate. You will never, ever hear a derogatory comment about him. Rick and I taught together at The High School of Commerce in Springfield, MA for nearly 15 years. He isn’t just a fantastic educator, and musician… There is so much more that defines him. Personally, I don’t believe the school district ever realized what an amazingly gifted and genuine talent he was. For a teacher who rarely missed a day of work, Rick improved the lives of thousands of at-risk kids during his tenure. He did the same when he taught at Van Sickle Junior High School, also in Springfield. Recently, one of his former students saw him at the local supermarket, approached him and said: “Thank you Mr. Garvin for saving my life - If it wasn’t for you, I wouldn’t have made it out of high school. I am successful now because you really cared about me when no one else did”. ~ Auditioned for the Newport Jazz Festival at age six with an arrangement of ‘Bluesette’. ~ Played his first nightclub gig at fourteen. ~ Made the All-Western, Massachusetts district band, and All-State Orchestra on snare drum. ~ Was a member of the McDonald’s All-American Band marching in the Macy’s Thanksgiving Day Parade in New York City. ~ Studied at The Hartt School of Music (Hartford CT) with the great Al Lepak and Stuart Smith. ~ Also played with The Boston Metropolitan Wind Symphony on snare drum and percussion. ~ Played at The Stardust Hotel in Las Vegas backing up The Mills Brothers. ~ Became a well respected judge for The Tri-State drumming contests, as well as high school district music competitions. ~ Competed at Carnegie Hall with the Falcetti’s Teachers Ensemble – Winning a world championship in the Virtuoso category. ~ For ten consecutive years, Rick’s junior high school marching band won numerous awards. They were the very first junior high group to compete in the Holyoke St. Patrick’s Day Parade…The second largest in the nation. ~ Taught in the After School Music Program for elementary students in Chicopee, Massachusetts for eight years. ~ Did all of the drum section writing for The Marksmen Drum and Bugle Corps. The Marksmen were commonly referred to as the show band of the 1990’s. However, Rick’s greatest accomplishment was marrying the ‘Love of his Life’, Susan, on August 1, 1981. They started dating on March 21, 1977 - and have been a couple ever since. Coincidentally, they both share the same birthday – May 6. It’s more than obvious they were meant to be together. After all the years that have passed, they are still madly in love with each other. They have raised two extraordinary children…Sons Jeff, and James. 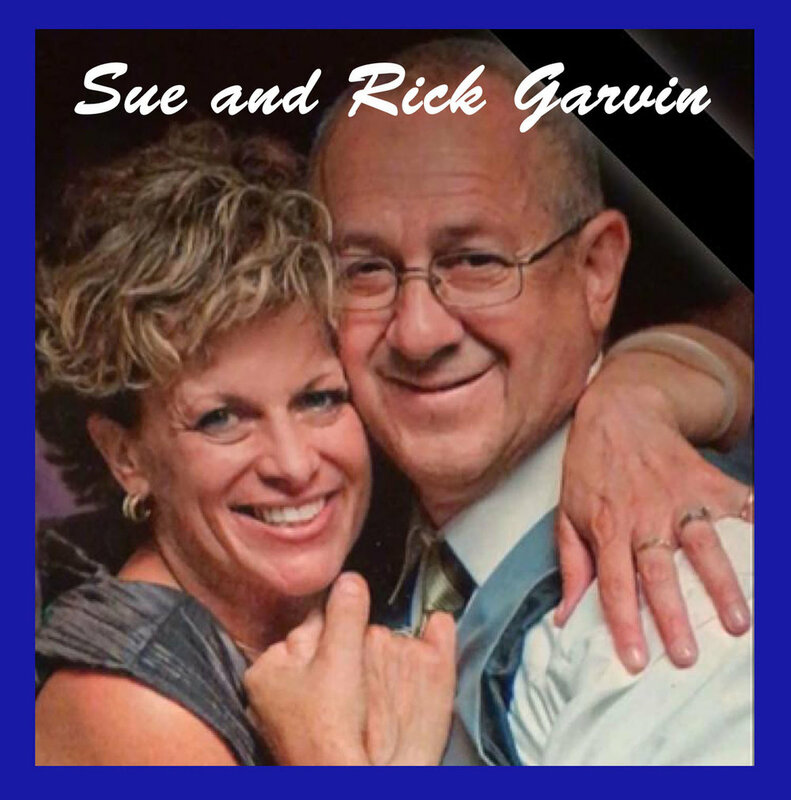 Rick and Sue are now the loving and doting grandparents of baby Warren Garvin. He is the son of Jeff and his wife Tiffany. Watching Rick and Sue with their grandson Warren is really an amazing sight to see. The Garvin household just keeps on growing… James was recently married to his love Shaina… Adding yet another daughter in law to the family. Rick became a huge Tower of Power fan in 1970 after purchasing their first album ‘East Bay Grease’. He listened to it repeatedly until the grooves in the record were worn out. In 1973, Rick first saw Tower of Power in concert at the legendary K-K-K-Katies in Kenmore Square, Boston. This is where he first met David Garibaldi. After the gig Rick struck up a conversation with David… Continuing on at a nearby restaurant. Rick asked Dave if he could transcribe some of his drum parts. The following day at a T.O.P. rehearsal, David said, “I’ll play it – you write down”…Garibaldi was amazed at how quickly Rick was transcribing his drumming in every detail. Sometimes, he would throw in Rocco Prestia’s bass parts just to see how they related. This is truly a rare gift… Another one of the many reasons he was considered to be a child prodigy. Since first meeting Tower of Power in 1973, Rick has seen them over fifty times…To this day, they are still his all-time favorite group. Recently, Rick and I were discussing David Garibaldi’s ‘King Kong’ beat…His use of overlapping, and the different ways he would hit the horn parts with infinite variations. From memory - In just a few minutes Rick had written out some of Garibaldi’s overlapping beats for me, while also describing the ‘King Kong’ beat in detail. In essence, Rick really is a prodigy…There is nothing he can’t do musically. He had an amazingly rare talent as a child, and hasn’t lost anything as an adult.